“Babies have big heads and big eyes, and tiny little bodies with tiny little arms and legs. A rainy-day activity that is a huge favorite over here is ‘Extraterrestrial Goo.” Appropriately nicknamed by Kendall over at Nutshell, all this unusual substance consists of is about a cup of cornstarch combined with about 3/4 – 1/2 of a cup of water. 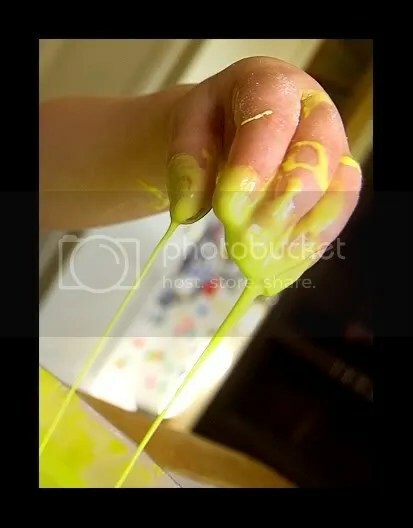 1-2 drops of food coloring can also be added to this concoction if you wish it, and so far we haven’t had any trouble with staining of fingers or clothing. This mixture used to be a popular elementary-school science experiment. If you’ve never made a concoction of this nature before, you really have to try it! T is too little to get into the scientific aspect of it, but if you have older kids, here is a link that might be fun. So far in this house we just do it to pass the time, and believe me – pass the time it does! T can play with this gunk for an hour straight. Oh! Miraculous Mess! How I ADORE you! It boggles her tiny little mind, which is incredibly amusing to witness, but completely understandable. Because it is a solid suspended in a liquid, it takes on aspects of both. The rougher you are, the more like a solid it becomes. Rapid stirring, smacking, or splashing (I/E things that make messes happen) are impossible. The harder she pushes on the gunk, the more firmly it sets in place – like a solid brick wall. If she calmly and slowly stirs it, it behaves nicely – like the liquid that she expects to be flowing through her fingers. 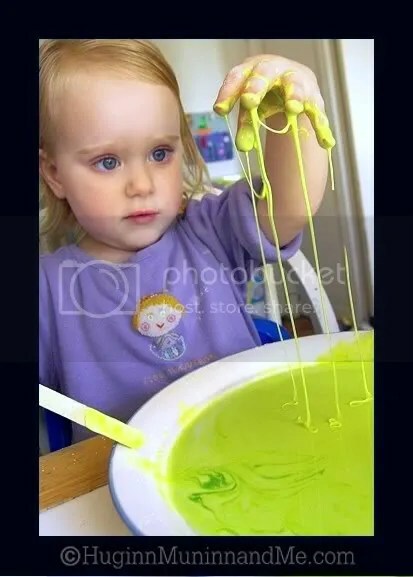 When she picks it up, it is solid-ish, but once in her hand, it ‘melts’ back into the bowl, once again playing the part of liquid. . . Very cool. And not as easy to make a mess with as you might think from the pictures! One of the BEST parts about this stuff, in my humblest of mommy opinions, is the clean-up. Just leave it where it lands for a bit, and once the water evaporates, you’re left once again with nothing more than (colored) cornstarch. Easy-peasy – sweep it and be done! This mixture can be saved to play with again and again – at least, until your rugrat disseminates every bit of it. After it sits for a bit, the water will (mostly) separate from the starch. Pour it off, and the remaining dampness will soon evaporate leaving you with a happy brick of cornstarch. Just add water and mix for more rainy day fun! That looks like so much fun, we might need to try it! That’s pretty awesome. Baking soda and vinegar volcano next (outside)? I absolutely LOVE, love, love extraterrestrial goo!! My girls love it too, though we leave it white because of carpet. We really should play with it again soon as it’s been a while. They can play with it for the longest time and clean up is such a breeze! If it gets on the carpet…boo-hoo…let it dry and vacuum up! 😀 Gotta love an art project that’s acceptable to leave on the floor, walls, chairs, table until it’s dry! Want even less of a mess to clean up, let them do it outside! When they’re done…let the rain do the cleaning. Hooray!! Do be careful saving it, though. From personal experience…it molds really easily. You think it’s dry, but it’s really not! Interesting… thanks for the tip. I imagine the climate has a lot to do with it, too. I like to leave mine on the oven while I cook, and I guess the heat prolly helps dry it out? I also put it in the fridge once I think its dry – no idea why, I’ve never thought about it! But I imagine that the dryness in there also stops the nasties from growing? I think I saw this stuff n ‘Time Warp’ they filled a large container with it and walked across it to show the cool properties. also pretty neat looking since it looks like you’re walking on water. Yet another craft/fun idea to steal from you for future use.